Ascot Interiors specialises in sourcing and fitting soft furnishings and window dressings either in your own home or your place of work. 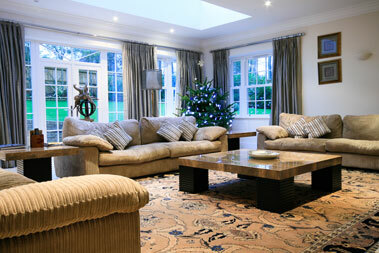 We also offer interior design work depending upon your individual requirements. Our approach is straight-forward, intuitive and personable. Our concern is to listen to your ideas and needs, and help you to achieve a look you'll be truly delighted with. Perhaps you require a blind to fit an awkwardly-sized window. A single, hand-made radiator cabinet to transform an unsightly corner. You may have a much-loved armchair that needs re-covering by a professional you can trust. Treat your child to a room with magical, one-off wallpaper or curtains. Maybe you want ideas on how to bring more light into a dark room. You may even wish to discuss bringing your whole house up to date. Contact us today for a chat or a free of charge home consultation. We come with decades of experience, enthusiasm and creative energy - and together we can bring your ideas to life.